Limes Hotel (142 Constance Street, Fortitude Valley) has the rooftop bar part down to a fine art. Enjoy a selection from the cocktail and champagne bar while exploring this open air establishment (although Limes does provide protection in the advent of rain). Don't feel like going home? You don't have to. Bar patrons receive a discounted rate of $99 per night if they choose to book a room in the hotel after the bar has closed. The Limes Hotel Rooftop Bar is also available for private functions. The Exchange Hotel (131 Edward Street, Brisbane) provides a comfortable, fully equipped courtyard setting in its Sky Bar. The 300 person capacity area boasts gas heaters, plasma TV screens, built-in sound system and outdoors video wall. There is also a designated smoking area. The bar is stocked with the hotels full range of beverages. 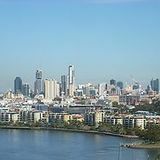 The Sky Bar overlooks Brisbane City. Birdee Num Num (608 Ann Street, Fortitude Valley) rooftop deck makes the perfect venue for a summer shindig. The new bar is appropriately whimsical, with Alice in Wonderland proportioned furniture, (fake) grassy areas and chandeliers in the bathrooms. You'll also enjoy a heated spa, swimming pool and stage. Level 2 Birdees Exclusive is available seven days a week and bookings are essential. And for a venue that offers the gorgeous views, minus the exposed to the elements part, the Rooftop Terrace at the Brisbane Powerhouse(119 Lamington Street, New Farm) is an indoor room with covered outdoor deck that overlooks the Brisbane River. The Rooftop Terrace can hold up to 140 people, cocktail style. It's a crime to stay indoors during a Brisbane summer so make the most of these venues with altitude.